@sanderson wrote: Turan, The different beans are doing good in their various 25 squares scattered about. I lost 3 squares right away. Should I try fava beans in those 3 squares? It is the second hottest bed in the garden. There are 2 squashes in the box, one of each. The zucchini on the right is the one affected and I was thinking (hoping) it was Neem oil sunburn. The Mix was saved from the 2'x2' box that had rot and termites. New compost was added evenly. I grew fava beans over the fall/winter/spring so I think it would be too hot to grow them now in CA. 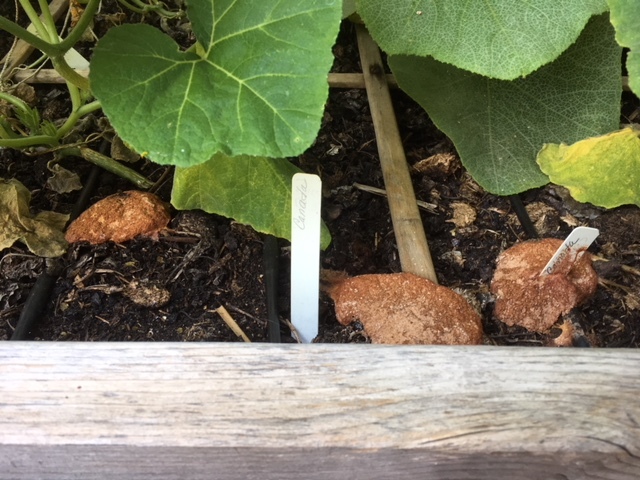 S, one solitary zucchini out of six is exhibiting the same leaf yellowing. They are all in the same box side by side, with a MM soil blend. I have sprayed them all with neem and I don't think it's the spray or a nutrient deficiency- it would be different if they all exhibited this, but they are all throwing blooms, so something is going right- I don't thing that it's burn, as they were all sprayed at the same time. YS, both squash have male flowers and continue to leaf. I'll be patient for now. Yolos, thanks about the fava beans being cool weather beans. The 1' x 3' bed is HOT in the summer. I also have to think of something short to plant in the 2'x4' where I pulled the garlic. Maybe soy beans? I decided, what the heck, I will plant soy beans in the former garlic bed. 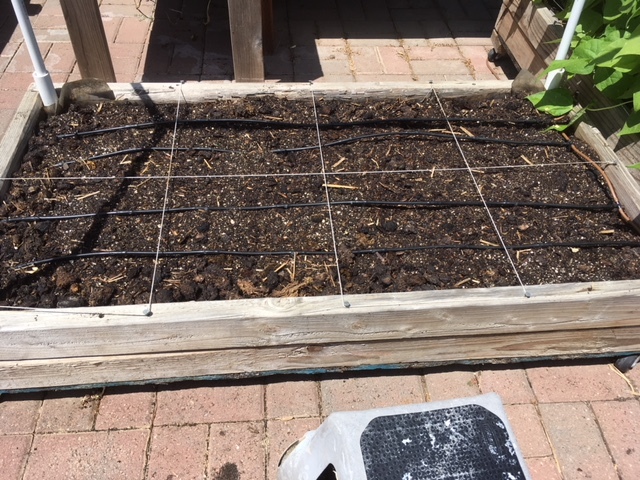 Amended with homemade compost, replaced the watering grid and the spacing grid, and it was soooo easy to know where to plant the beans at 9/square! Yes, the compost looks unfinished, but I am amending for the future. The chunky monkey I put in in October is all broken down. The bed has worms even though it is on wheels and didn't start with any worms. Build it and they will come. 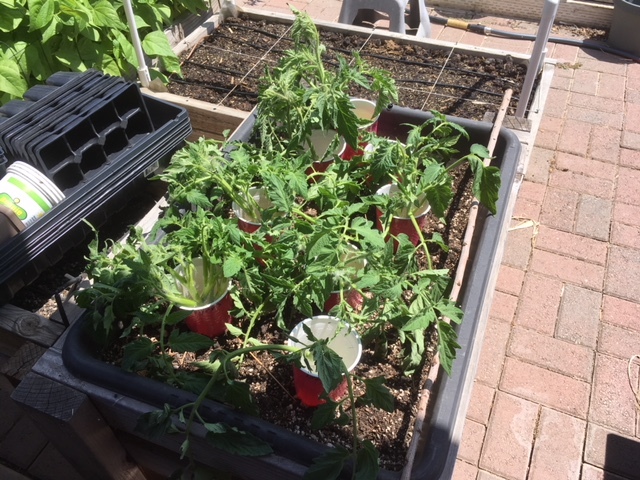 I suckered the indeterminate tomatoes in the 2'x7' table top and couldn't bear to throw them away. These are in labeled cups of water. Boys aren't the only ones that like toys. 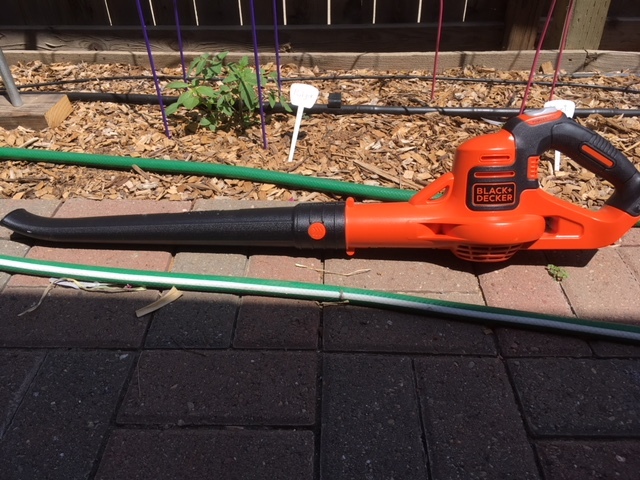 I got a new toy that is perfect for my tiny yard, a leaf blower. It is operated with a rechargeable battery and only weighs 3 pounds. Perfect for my back. We are like the dust bowl with fine soil being deposited all over everything. 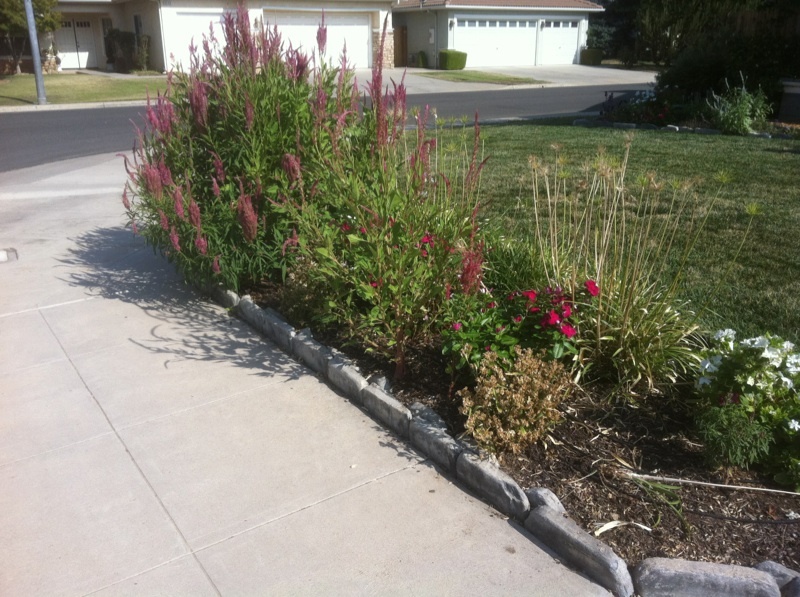 It is supposed to get up to 101*F today, so I got up early (for me) and watered all of the beds. I also picked a yellow squash, my 2nd one in 5 years!! I will be ecstatic if my summer squash actually produce this year. Picked Blue Lake bush and Dragon tongue beans, and the 2nd Muncher cucumber of the season. Yesterday, my husband helped me build a new compost pile in the Lifetime tumbler. While I can turn and empty the bin, it is too high for me to load except for buckets of mowed leaves. It was up to 110*F this morning. I turned, opened and watered several times. I still have more mowed leaves, horse manure and coffee grounds I can add. I'll wait until this evening to see if it has settled enough to top it off and see if the temperature is going up. I didn't water as much as I usually do to see if I can find that sweet spot of enough water to take off but not too much that the ingredients ball-up. The para-cord for the overhead sunshades are in place. How are the rest of you Californians doing? Here are the 7 indeterminate tomatoes in the 2'x7' table top bed (7" of Mel's Mix). I'm trying nylon netting as support this year, clipping or tying the main and a few daughter stems (suckers) to the netting. Lookin' good as usual, S.
I'm eating a few cherry tomatoes and trying to keep my asparagus and artichokes alive while I spend almost every waking moment working on the new house. I will probably push the fall season by starting seeds inside around the first of August. By then, all this house nonsense should be history and I can get back to some serious gardening. Are you planning on living in the new house or renting it out? Just make sure you keep a hold on the seedling equipment someone left behind. Oh, my gosh. It's 105*F right now and I don't see how the plants are standing up to the blast of heat as well as they are. It's suppose to get cool down to 98 Mon and 90 on Tuesday, thank goodness. I may hand water or turn the drips on for a while this evening. I checked the temp of the tumbler compost pile we made yesterday and it was up to 150*F, sitting in the shade (it's the microbes that create the heat, not the sun or weather). I topped off with the last of the coffee grounds and 2 buckets of leaves. Watered the new layer and will wait until tomorrow to check the temp and tumble. It's important to keep introducing fresh oxygen into the mix. I think I have the moisture correct. This is day 8 for the compost tumbler and it is still cooking around 160. I turn, open, turn, open, etc. to get oxygen in there. I also managed to get just the right amount of water so nothing is clumping! Yesterday, I found an interesting "creature" in the winter squash bed. 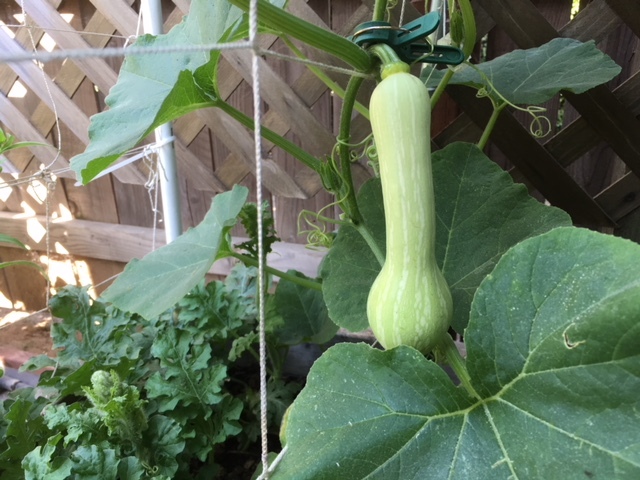 We all know what it is, but this is only the second time since I started SFG in March 2013 that I have had it. .
One Canadian winter squash seems to be thriving. It is about 6" in this photo from yesterday and is an inch longer today. Today it was 104*F!! Tomorrow I will put up at least one sun shade (8' x 16'). 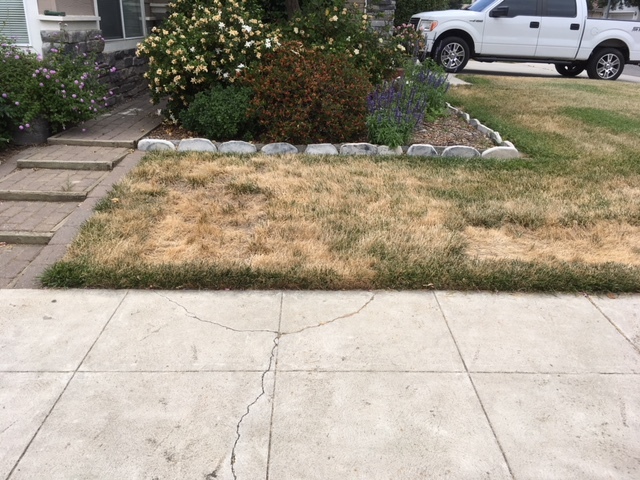 The grass is basically dead even though it is watered. I looked at Sacramento, Redding and Fresno for the next 10 days and it looks horrible on the 10th day. June 23, 110*F in Fresno, 113*F in Redding, and on June 22 in Sacramento, 110*F. There has got to be an error here. The beans have been producing nicely. I have picked 1 1/2 gallons so far. I blanched and chilled one gallon tonight and popped them in the freezer on a cookie sheet. Cucumbers keep rolling in. The summer squash may be a bust this year even though they have a nice, new bed. The 8 cotton seeds go in tomorrow. I'm behind on chopping more bedding straw for mulching. That's it for now. How are the rest of you Californians do? @sanderson wrote: Today it was 104*F!! Tomorrow I will put up at least one sun shade (8' x 16'). 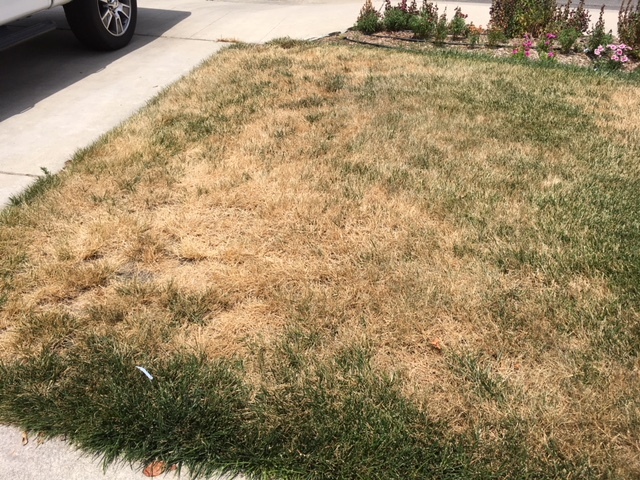 The grass is basically dead even though it is watered. I looked at Sacramento, Redding and Fresno for the next 10 days and it looks horrible on the 10th day. June 23, 110*F in Fresno, 113*F in Redding, and on June 22 in Sacramento, 110*F. There has got to be an error here. AARRGGHH!!! You sound so normal! I feel like a hampster on a treadwheel. I need therapy, and the swimming pool next door is doing an excellent job of supplying it. Everything else is upside down and sideways. My only gardening news is that I found a happy little potato plant left over from last year. Now that it's on my radar, I will water it and see what happens. Maybe the @#%^ grasshoppers won't see one little plant, all by itself in that great big bed. Now you've done it. A swimming pool? To die for. I keep thinking of an 8' x 30" above ground pool. I've only seen one adult grasshopper this year, but I saw two green beans this morning that look like someone snacked on them! My bean progress so far. Dragon Tongue (+), Purple Podded and Blue Lake bush. Into the freezer for a pre-freeze before the Seal-a-Meal. Ya know, S, frozen things can be shipped up north a few hundred miles without spoiling. Just sayin'. I may just throw a nylon mesh bag over that lonely little potato plant -- just in case. @countrynaturals wrote: Ya know, S, frozen things can be shipped up north a few hundred miles without spoiling. Just sayin'. Good looking beans. Aren't the Dragon Tongue Beans good producers. I stopped growing them because I hate to bend over to harvest them but they sure grew real well in my climate. I see good eating in your future. DT is my favorite. This summer, I put the green Blue Lake bush in the 2' table top so it would be easier to find the beans against green leaves. The DT went in the 2'x 4' bed on wheels because they are easy to find and I wouldn't have to bend over so long to find them. Are Rattlesnake "green beans"? I don't know if I will grow Blue Lake pole in the trellised bed. They (BL) are just now producing and the taste tests for both pole and bush are pending. @sanderson wrote: DT is my favorite. This summer, I put the green Blue Lake bush in the 2' table top so it would be easier to find the beans against green leaves. The DT went in the 2'x 4' bed on wheels because they are easy to find and I wouldn't have to bend over so long to find them. 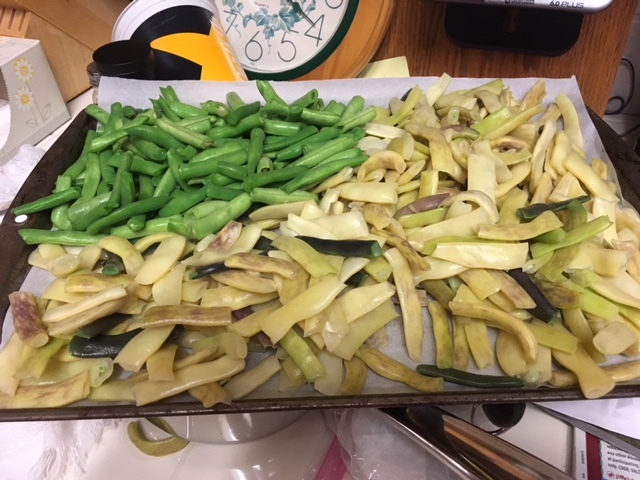 Yes, Rattlesnake Pole Beans are green snap beans. They actually have a very light purple marbling which disappears when cooked. They are aggressive pole beans. They grow over my 8 foot trellis and then come about halfway back down. They continue to set beans in the heat of the summer better than any other bean I have grown. The only problem is they get strings if not harvested very young. 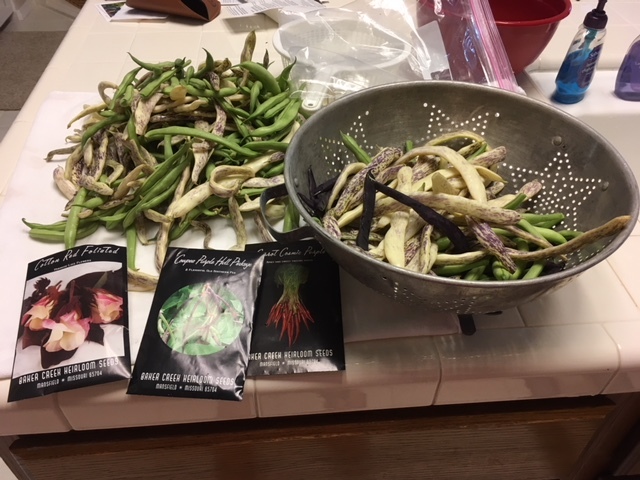 So I grow Fortex or Emerite pole beans in the spring and then Rattlesnake beans in the heat of the summer. Thank you !! I have a few I can plant in a 1'x3' to try them again. I think spider mites got them last time. 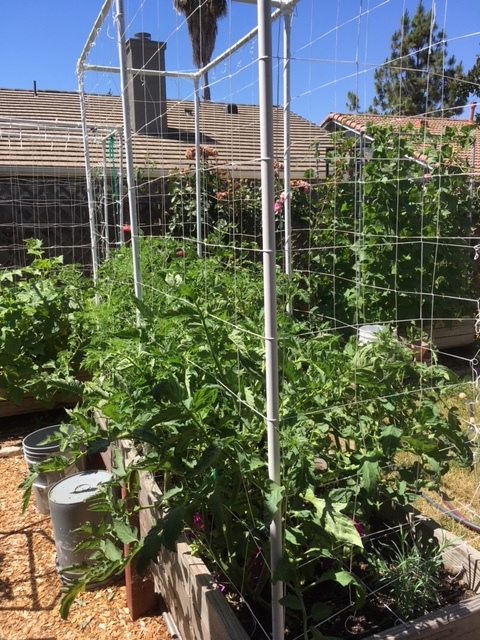 Just got back after almost 2 weeks away and found that my tomatoes should have been strung up before I left- they pushed up another foot while I was away and are loaded with suckers. Got some work to do.The zucchini are going like gang busters- I hope I can find homes for all the fruit. I planted beans and they are a long way from producing (should have put them in sooner, but the frosts were late and I didn't want to risk a failure). Looks like the manure, compost, and worm-poo teas are really helping things along. Darned leaf miners are at it again- slipped in while I was away. Overall, I am elated that my garden didn't get killed off while I was away (as often happens when I have house sitters over that don't know how to care for the gardens). I had a friend watch over them and he did a good job keeping things wet throughout the hot spells. Thank goodness for your friend who knew how to take care of the garden. If I didn't have drips on automatic I couldn't leave for more than 24 hours in the middle of summer. I watch the weather in several CA areas and it looks like you are having nice temps. What else are you growing this year? How are the orange trees? I've got my first blusher!! It's on one of the little Snow Fairy plants that is loaded with green tomatoes. 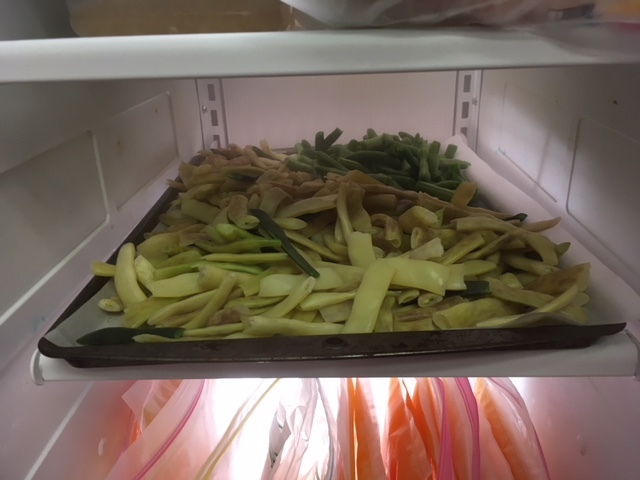 Yesterday, I harvested 10 cucumbers and another 4-serving batch of beans. @sanderson wrote: I've got my first blusher!! It's on one of the little Snow Fairy plants that is loaded with green tomatoes. Congrats! So exciting - I can't wait to see some in my garden. Slow it down S.- your garden is so far ahead of mine I'm probably going to be harvesting my veggies on Christmas eve However, this year I'll have my lemons and lime crops in on time thanks to my friend's keeping up on the watering while I was off playing. YS, You may get you wish. We are headed into the 100's for several days, when everything will come to a screeching halt. Sun shade will have to go up, but at least the overhead support paracords are in place. I harvested 2 Japanese Millionaire eggplants today. The Snow Fairy tomatoes are just packed with tomatoes that are hard to see because of the thick foliage. Beans are still producing and I am picking an average of 2 large servings per day. Most are being prepped for the freezer for winter eating. 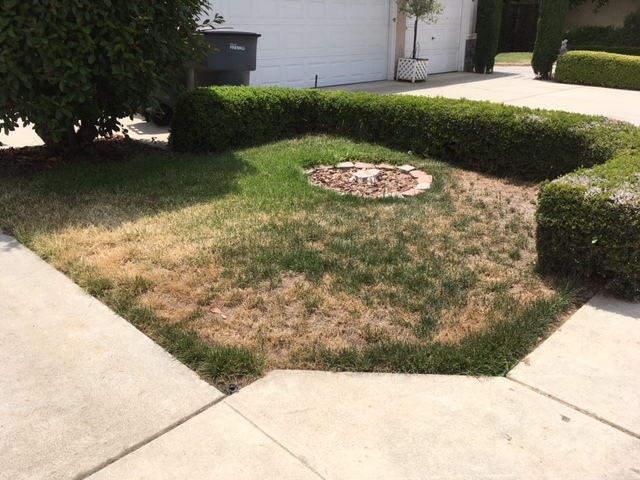 The front lawn is basically dead from the fungus that has been sweeping Fresno for a few years. 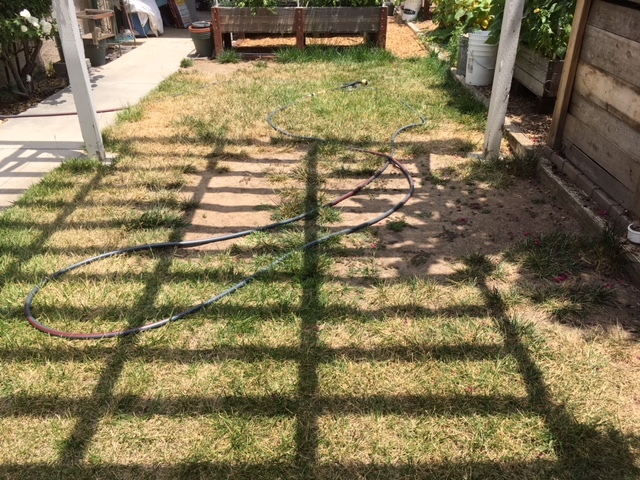 We will be taking a lot if not all of it out and putting in a BTE style yard with drips and lots of pink, purple and white plants and flowers. 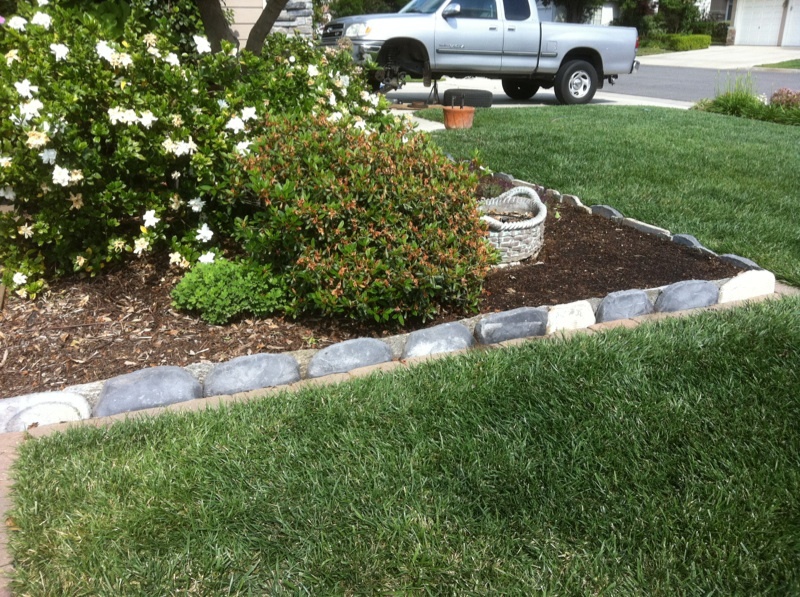 With the CA Lawn Removal Rebate, half of the cost should be covered. The backyard is about the same. A lot of lawns here in Ottawa have looked like that over the past few years. Here it is caused by white grubs in the soil. They eat the roots of the grass and kill it.